All my books are available from Amazon.com. Bulk orders at discounted prices for churches, ministries and re-sellers can be placed directly with me. 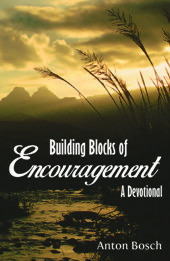 A collection of 60 articles that are designed to edify, exhort and comfort. Each article stands on its own and can easily be rea d in just a few minutes. While the truths expounded in the articles are simple and fundamental they will remind the reader of eternal truths that may have been forgotten. The Author often brings a fresh perspective to old texts. Within the pages one will find not only food for devotional thought, but solid practical doctrine that will edify any sincere reader to continue to “run, with patience, the race that is set before us” (Hebrews 12:1). Pastor Bosch does not resort to the pop psychologies of the day, as many others do, to make his points. He stays true to the Word of God as he exhorts us to live out our faith with an unwavering commitment to the authority of the Scriptures and our Lord and Savior, Jesus Christ. — Pastor Gary Osborne. Available from Amazon as a paperback or Kindle book. Anton Bosch is a brave Christian scholar and pastor to write a book such as this at a time when the validity of the Bible’s teachings is being called into question by many. He is even braver when the field in which he has chosen to write, d eals head-on with the organizational structure and personnel of the church. Modern and postmodern biblical scholarship seldom assigns a high status to the doctrine of the inspiration of Holy Scripture, and even less to the conservative and more fundamental schools which hold dear the belief that the Bible was verbally inspired by the Holy Spirit. 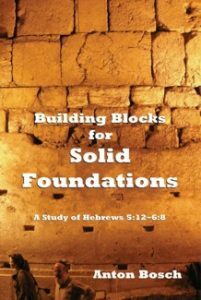 This unquestioned, high regard for the Bible constitutes the foundation of this book. Professor Arthur Song, Head of Graduate School, South African Theological Seminary; Research Fellow, University of Zululand. The author should be commended for his honest and objective exposition of the New Testament model of the organization and function of the church of Christ. He has done so in a very scholarly way, and this work should be seriously considered by thinking people all over the world. The book sets out clearly the New Testament principles of every major ministry in the church, and distinguishes these principles from erroneous teachings and practices. The purpose of Building Blocks of the Church is to help us conform to the only true standard of Christian worship – the biblical one. From the preface by Professor Johan Malan, South Africa. 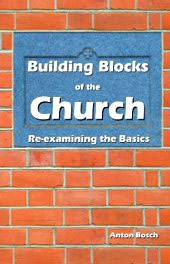 Building Blocks of the Church is available as a paperback from Amazon. Are you contending for the Faith in a wrong way? Contentiously Contending is given as a clarion call to a growing epidemic of Christians using social media, blogs and other online venues to create great harm to the testimony of Christ and of His servants. Though corrective words are needed to men publicly Anton Bosch teaches us how to do this in the same way Christ and the Apostles did in love and humility. 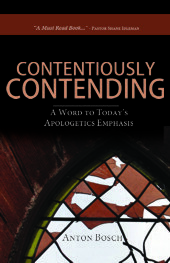 This book will help you to truly contend for the faith. Or as a free Kindle download.